The Monitor page displays current active Check-In Locations. From this page you can see the number of attendees for each Occurrence (Class), the leaders checked-in (if you using Room Ratios), the available seats (if using Room Ratios), the start and end times of the Occurrence, and the Location. Click the View Occurrences link to view the details of the Occurrence and a list of the people currently checked in. 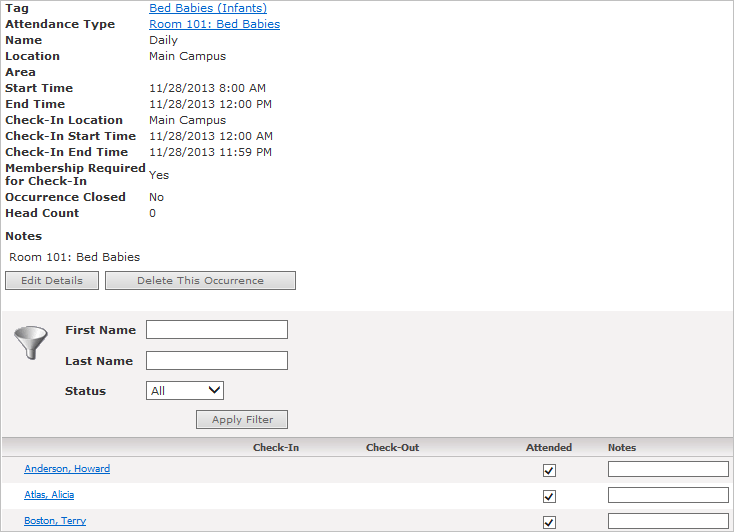 Click the View Occurrences link to view the details of that occurrence and to modify the person’s attendance.